Prasad comes from the word Prasāda in Sanskrit. two Sanskrit words derived from it are Prasanna and Prasāda. When someone is offering Prasāda, it is with so much joy, brightness, and internal clarity. There is stillness in the atmosphere after a group meditation, and at the same time a sense of expectancy as a young bride and groom stand facing each other on their special day. It is a joyous occasion. First they garland each other with rose garlands, and then gently and lovingly place charged rings on each other’s fingers. Then they each are given a small piece of a special sweet to place in each other’s mouth. This is no ordinary sweet, as it has been divinized: even the minutest amount will bring spiritual well-being and joy to the receiver. This sweet is known as Prasad. The two young people start their married life by offering each other this divine gift. After the short ceremony, they then share their wedding Prasad with all those who are there to celebrate with them, and keep some for those who could not make it but are also in their thoughts. "So what is the best attitude we can have when offering Prasad? It is one of complete love and reverence, with such humility and innocence that we are offering the most potent part of that which we offer. In doing so, we create an osmosis between what is offered and the one to whom it is being offered." Special days of celebration always call for such special offerings. Be it this marriage, the birth of a newborn baby, or any other milestone. We usually celebrate by offering heartfelt and joyous prayers to the Lord, accompanied by food and gifts, which we then distribute to our friends and family. This tradition exists in all cultures, religions and ethnic groups, as a way of sharing our joy, first with our Maker and then with everyone else. There are so many examples: the sacramental bread of the Eucharist, holy water, sweets, cakes and flower offerings, etc. Even customs that are very secular in nature today find their roots in earlier sacred offerings. For example, the tradition of lighting candles on birthday cakes is said to have come from the ancient Greeks, who would make round cakes to honor Artemis, the goddess of the moon. The lit candles on the cake represented the glow of the moon, and the smoke from the blown-out candles carried their prayers and wishes to the goddess who lived in the sky. For simplicity’s sake, I will refer to all such offerings as Prasad. What is Prasad? Why is it given? How are we meant to receive it? Let’s explore these questions further. Prasad comes from the word Prasāda in Sanskrit, which was originally described in Vedic literature as a spiritual state. In an early text, the Rig Veda, Prasāda is described as a mental state experienced by gods or sages, in which they felt a spontaneous generosity, often granting boons to their followers. It is actually only much later in history that Prasāda came to describe the offering of material things such as clothes, flowers and food, especially sweets. Looking into the etymology of the word itself, the two Sanskrit words derived from it are Prasanna and Prasāda. Both words evoke a joyful feeling. Prasanna means ‘clear, bright, and tranquil’. Similarly, when someone is offering Prasāda, it is with so much joy, brightness, and internal clarity. When offering Prasad, our attitude is of the greatest importance. The 20th century yogi, Babuji of Shahjahanpur, once recounted the story of how his teacher, Lalaji of Fatehgarh, would make an offering to the divine beings on the new moon day. According to the ritualistic fashion, he would pour water and offer it to his forefathers in the higher world. However, when Babuji observed what his teacher was really doing, he found that Lalaji was actually transmitting the essence of the water he was offering. So it is not the outer ritual that matters but the inner condition, the attitude behind the ritual and how it is actually done. So what is the best attitude we can have when offering Prasad? It is one of complete love and reverence, with such humility and innocence that we are offering the most potent part of that which we offer. In doing so, we create osmosis between what is offered and the one to whom it is being offered. In fact, that is what gives Prasad its joyous quality and reverence – something that I have offered to my Maker, I can now share with all His other children. "In fact, that is what gives Prasad its joyous quality and reverence – something that I have offered to my Maker, I can now share with all His other children." How to distribute prasad to others? People often follow a lot of cultural etiquette when distributing Prasad, and in today’s world this etiquette can seem too ritualistic and anachronistic at times. But if we explore the science behind the etiquette, we soon realize that there is a purpose to each gesture or ritual defined by our elders. The purpose is generally rooted in the scientific principles and physiology of well-being in a very precise way. 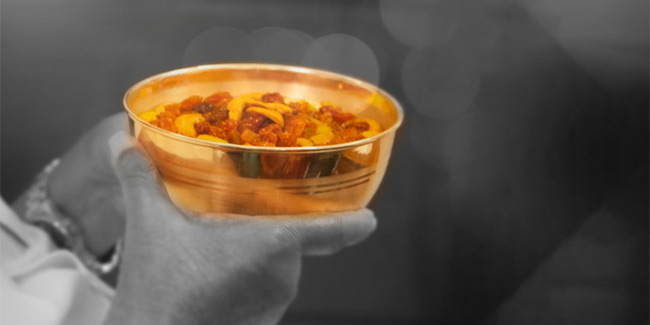 In India, one such ancient tradition is to always give and take Prasad with the right hand. Let us try to understand a little more about how our body, brain and nerves work together. First, when we study the physiology of the human body, we discover that the right side of the body is primarily controlled by the left hemisphere of the brain and the left side of the body is primarily controlled by the right hemisphere of the brain. Second, our autonomic nervous system controls our automatic physical responses to situations. It is made up of the sympathetic and parasympathetic nervous systems. When the sympathetic nervous system is stimulated, our body becomes more active and excited, and endorphins and cortisol levels increase. In contrast, when the parasympathetic nervous system is activated, our body relaxes and calms down, reducing our endorphin and cortisol levels. There is something called Cerebral Hemispheric Laterality1 - each hemisphere of our brain is more connected to one of these autonomic nervous systems. When we stimulate the right hemisphere of our brain it invokes the parasympathetic nervous system, and when we stimulate the left hemisphere of our brain it invokes the sympathetic nervous system. So when we use our left nostril or left hand, it stimulates the right hemisphere of the brain, which is connected to the parasympathetic nervous system, helping us feel calmer2. Hence, there is a yogic practice of breathing multiple times through the left nostril, while closing the right nostril, in order to lower stress. If we observe closely, perhaps this is also why Babuji of Shahjahanpur gave blessings by raising his left hand instead of following the usual Indian custom of raising the right hand. The purpose was to remain calm and cool, exercising discrimination in giving only what was best for the seeker’s spiritual growth. So what happens when we give Prasad? Our attitude for the occasion is meant to be joyful, with a feeling of love and gratitude towards the Divine. We want to remain active and excited, which happens when we give from the right hand, which is connected to the left side of the brain and the sympathetic nervous system. 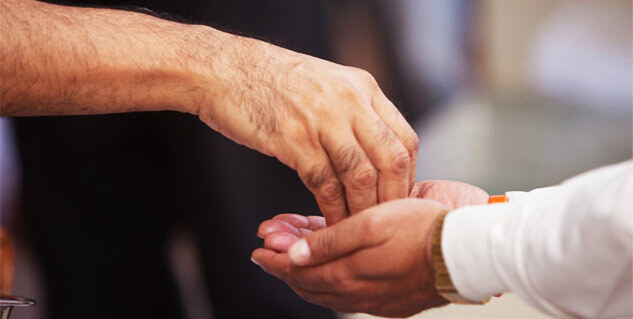 When we receive Prasad, also, the tradition in India is to take it with the right hand, which resonates with sympathetic responses so that we can reciprocate the feeling of joy of the giver. If we were to use our left hand it would resonate with the parasympathetic nervous system, and we would be mellow rather than sharing in the giver’s excitement and happiness. When Prasad is offered to us in a beautiful and joyous way, we want to be in an equally joyous mood, grateful to receive this gift. Imagine being angry or upset when we take this divine offering in our hands! What message would it give to our Lord? How would our system react? There is another aspect of great scientific and spiritual significance in the giving of Prasad: only a very small quantity of Prasad is supposed to be given and eaten. This is so that what little is given will remain in the body rather than being excreted, helping to purify the whole system. The science of how Prasad can purify the system and cure spiritual ills is also a subject of profound wisdom for another time. 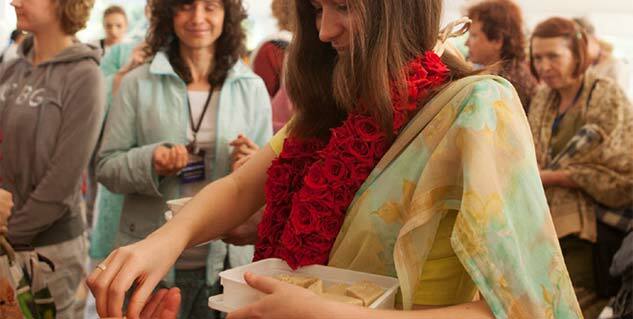 How can everything that we eat become an offering of Prasad? The process of conscious eating has been explained in detail in two of Babuji of Shahjahanpur’s books, and this we will take up in the next article.